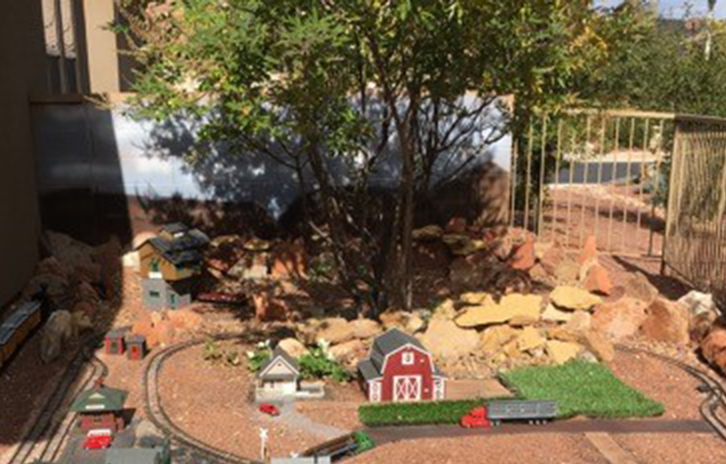 Werner has recently added two new elements to his outdoor G scale railroad. The first element houses his rolling stock. Werner constructed a 2-track shed measuring 13" wide, 13" high, and 12' long using a composite fencing material instead of wood. The weather resistant shed allows lockable storage for all his rolling stock with additional capacity for three more cars as the roster grows. (When not in use, locomotives are stored off the layout.) Not shown are hinges along the shed's back wall which allows the top to swing up for full length access to both tracks. The second addition involves the railroad's background scene which Werner had previously painted on the block wall at the rear of the layout. As you see, the background ended abruptly at the end of the wall. To extend the background to the full width of the layout and obscure the view of the front yard, Werner began the project by mounting two panels of heavy screen material to the steel fence with screws and washers. Once securely adhered, Werner painted the screen to match the block wall.